I keep a list of all the films in my collection (450-ish of them) and the last date that I watched them. A few years ago I decided to go through all the ones I hadn’t seen in at least five years and give them a fresh look. It was a worthy endeavor, allowing me in some cases to renew my enthusiasm… and in other cases realize it was a movie I didn’t need to own. As I started devoting less of my free time to watching movies, I fell further and further behind. At the time I write this, there are 90 films (not counting a few that I don’t care for but are part of box sets) that I haven’t watched in over five years. At the top of the list was this one. Even though it’s one of my top 100 and I had no resistance to seeing it again, I kept holding out due to rumors that a restored/remastered version was coming. Finally I got tired of waiting so I pulled it off the shelf and dusted it off. Just wait, I’m sure Criterion will announce a Blu-Ray release any day now. Not that anyone cares about my viewing habits. I don’t know why I felt the need to explain all that. I had never read a word of Kafka before I saw this movie. Now I’ve read everything and he’s one of my favorite authors. And The Trial is one of my favorite books. And Orson Welles adapts it brilliantly. For those unfamiliar with the work, it’s the tale of Josef K. (Anthony Perkins), a mid-level bureaucrat who wakes up one day and finds himself charged with an unnamed crime. As he flails around for answers and assistance, his “case” — which remains an abstract notion, being conducted without his knowledge or participation — seems to be more and more doomed. It’s a story that follows nightmare logic, not wake up screaming nightmares, but the nightmares that give you cold sweats and lingering anxiety. The world Josef finds himself in is one where his words are always twisted, where friends become enemies on the turn of a phrase, where everything he says or does only makes things worse. Perkins is fantastic, especially when he gets on his high horse and starts making righteous speeches. This isn’t Hollywood where the rousing oratory indicates moral victory and is followed by thunderous applause. Or when there is applause, it’s being arbitrarily prompted for behind Josef’s back. He imagines himself a champion of the people, a crusader for justice and right… his naivete makes you wince. Because the story is so much about how things don’t go the way they should, the narrative can twist and turn, leading you down blind alleys and dead ends. Along the way, it shines a light on myriad ways in which society breaks down, or its fragile weak spots. The mechanisms of trying to keep civilization afloat are constantly under attack by hypocrisy, bureaucracy, self-interest, ignorance, deception, corruption. And the way power trumps all sense of caring. People puff themselves up and knock others down, and the only thing that really matters is the authority behind you. Or the appearance of it. As the film opens, Josef is beset by a pair of detectives who seem to almost deliberately misinterpret everything, taking his words and throwing them back at him in the wrong context. Josef tries to keep up, but it’s not just the verbal confusion that confounds him… it’s the fact that he knows and they know that they hold all the cards. It’s one of those situations you see in a movie and ask yourself, “What would I do?”, but the answer is there’s nothing you could do. Besides the thematic density and unpredictability of the narrative, it’s also a hell of a fine film to behold. 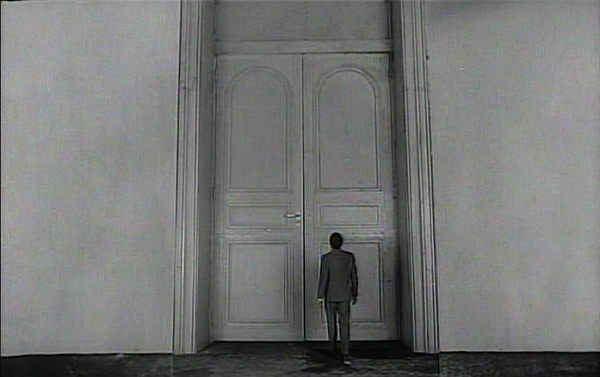 Welles’s penchant for extreme camera positioning and dramatic movement suits this material perfectly. Kafka is right at home in a German Expressionist mode. Long, stark shadows and dizzying angles. And the locations are amazing. There’s always something off about these spaces. The ceiling is too low or it’s too high, corridors are too narrow. One space doesn’t appear to lead logically to another. Rooms are stuffed to the gills with papers and books and bric-a-brac…. or they stretch out to lunatic measurements of empty space. It all adds to the sense of unease. Terry Gilliam surely found some inspiration here. This entry was posted on March 3, 2015 at 7:34 pm	and is filed under Movie Reviews. You can follow any responses to this entry through the RSS 2.0 feed. You can leave a response, or trackback from your own site. Great review – I definitely want to see this. Thanks.